So today, this, the first friday in June, is National Doughnut Day here in America. Sounds like a silly, sugar-filled excuse to eat deep-fried dough coated in melted deliciousness, but really, it started in 1938 as a fundraiser for the Chicago Salvation Army! This is a holiday I can get behind. :) Trust me, I headed to my local Krispy Kreme store to get my free doughnut, a delicious lemon cream filled one. Mmmm. I also 'had' to pick up a couple glazed for the road. I think I'm one of the weird folk that doesn't like them very much when they're hot from the fryer- I actually prefer them cold, like almost frozen. 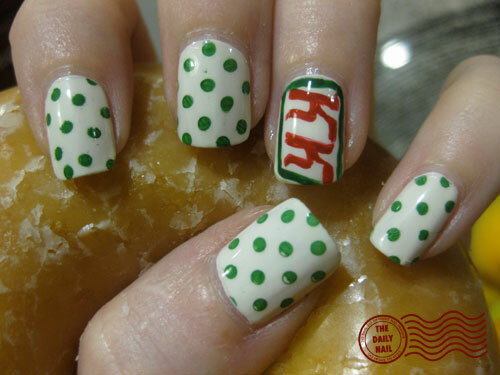 :-D I decided that in honor of National Doughnut Day, I would do Krispy Kreme nails, since they're super delicious. :-P (even though the best doughnuts come from back home in Michigan at H&H Bakery, where I worked and went to all the time when I was younger). I used American Apparel Cotton as a base, with Nubar Forest applied with Konad Plate m79. For the iconic red K's, I used a mixture of American Apparel Downtown L.A. and A Beautiful Life Poison. Topped it off with 2 coats of Seche Vite top coat. Krispy Kreme is a logo I can love, but I must admit I like Dunkin' Donuts doughnuts better. I prefer the cake doughnut to the raised doughnut. But that's me. Really, any doughnut is better than no doughnut!!!! Hurray for National Doughnut Day!!!! Absolutely awesome nails! I love Krispy Kreme. :) Mmm....wishing I had some right now. Heh. You really do have a national doughnut day? And that's what Krispy Kremes are. 2 things I have learned today. Love the spots. i like Krispy Kreme but Shipley's Donuts in my hometown of Pearland, Texas beats Krispy and Dunkin'!!!! I vaguely remember a post where you were in the West Michigan area? Am I wrong? If not... next time, you need to try Sweetwater's doughnuts, they're the best! I am so sad I missed doughnut day! I miss eating doughnuts! Great nails, but you did say we would get responses on that post, did you not? Cute, cute nails but glad I didn't see this yesterday. KK is less than 2 miles away and I would have been over there like a shot. KK's are like the ones Grama use to make...light, fluffy and gone in three bites. Not those gutbombs the hubs likes from the grocery store. Dang it... why don't they have krispy kreme donuts in austalia? !